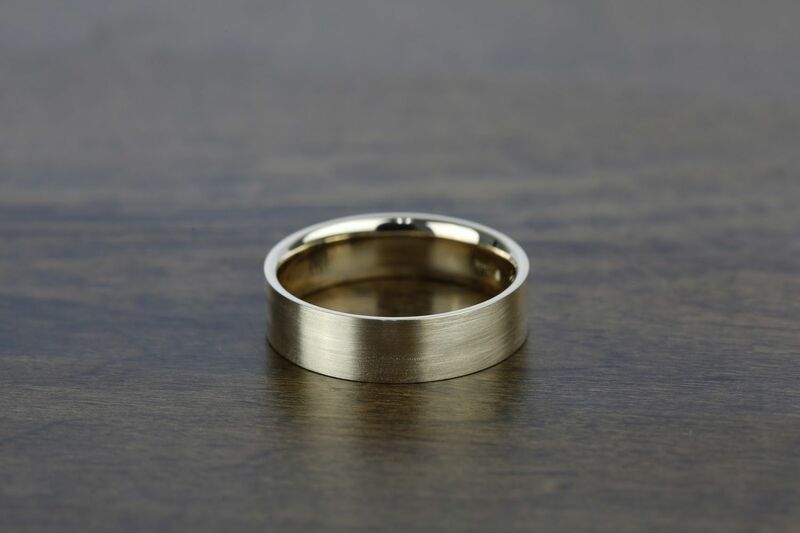 Simple gold, silver or platinum bands for him are always popular and timeless, but what if simple isn’t his style? If he’s not the under-the-radar kind of guy, then don’t opt for a conservative, understated or classic style for his ring. We’re all about creating a ring that’s a reflection of him, and custom rings for men take the basic wedding band to another level. Textured metals, gemstone accents and custom creations are in…we’ve got it covered. When you’re ready to move past sleek simplicity, scroll through our list of amazing custom rings for men; made with alternative materials and skilled techniques, seeing is believing. Some retailers might offer a design you love, but only in a limited selection of metals; none of which you prefer. But in the Brilliance collection, all the rings available can be customized to suit your style, including metal type. Perfect example: one client really loved one of our bands, but believed it was only available in cobalt. What was his preference, you ask? Shiny and durable platinum! We styled the ring in his favored metal to create a custom ring that was all him. That plain and traditional band is just a blank canvas for your ideal customization. Every ring can be recreated and customized with unique metal finishes. Brushed effects create a muted, almost blurred, texture to metals. While hammered texture metals reveal a rugged and masculine design. You also can request textures such as stippling or add engraving. 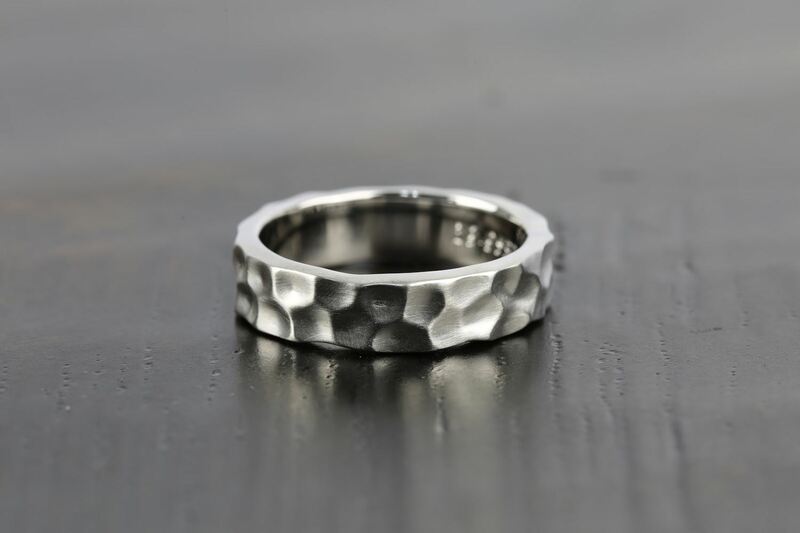 A heavy texture finish (like the one pictured above) creates a truly one-of-a-kind ring. This domed ring features an exaggerated hammered finish that demonstrates a unique architectural design. Who said colored gemstones and diamonds are just for the ladies?! Men also appreciate color and style in their rings. One of our most popular customization requests includes adding gemstones to men’s wedding bands. This groom wanted to integrate black diamonds to create a bold outline for his fingerprint wedding band design. Sometimes your dream design isn’t available anywhere. Bring your vision to life by working with one of our jewelry designers. 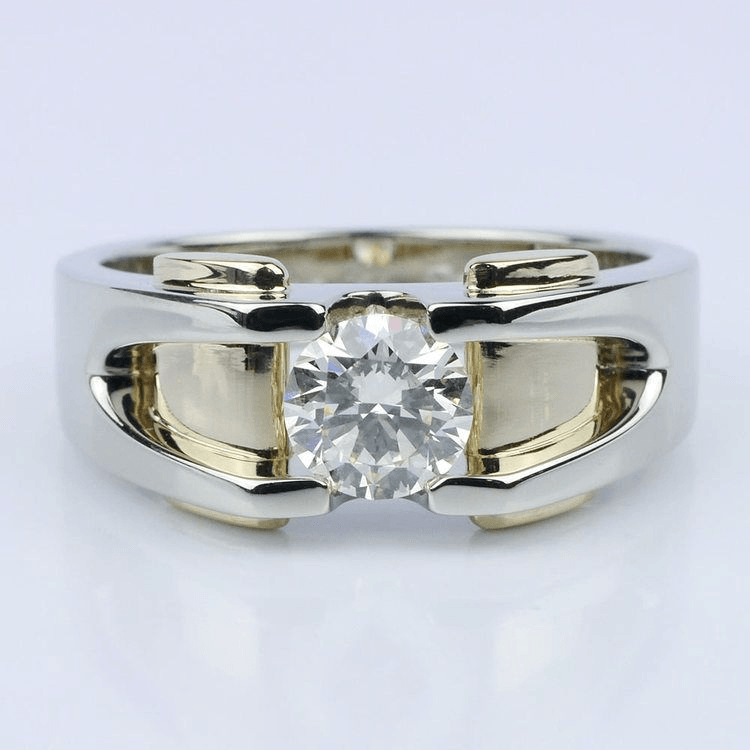 They’ll help create the ideal ring for you; if you can imagine it, we can create it. A client of ours insisted on a ring featuring a bold center diamond. 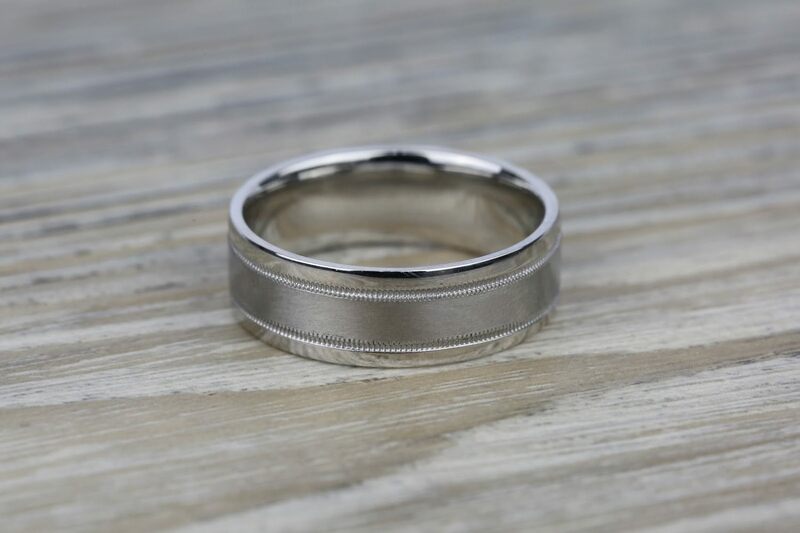 He was unable to find what he was looking for in any stock collections, so we worked with him to design this stunning two-tone men’s wedding ring. Complete with a boast-worthy a one-carat diamond solitaire. Some men want their ring covered in fiery diamonds for an amazing statement piece. 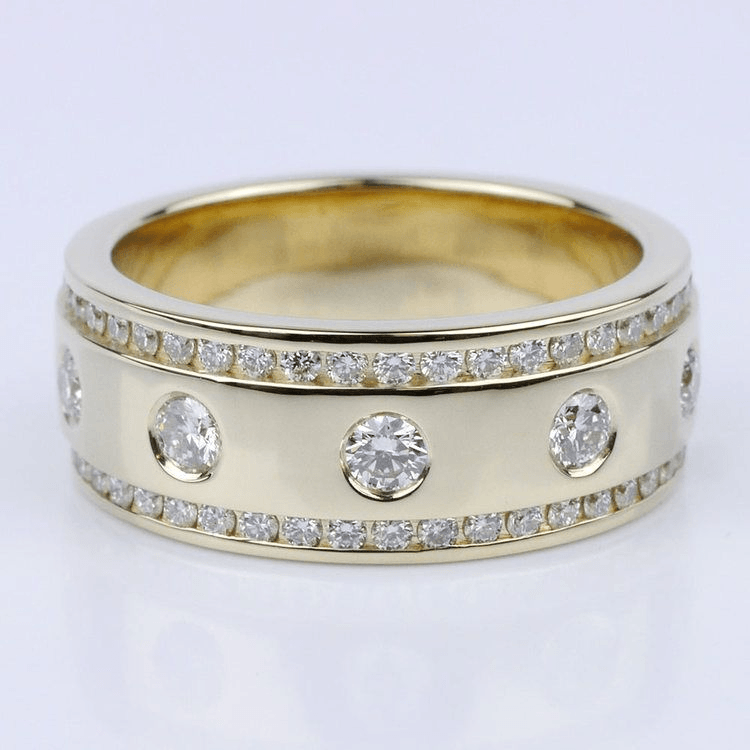 We created a gold wedding band inset with diamonds and accented with crowns of more diamonds around the top and bottom of the band. The result was a ring that looked fit for royalty. 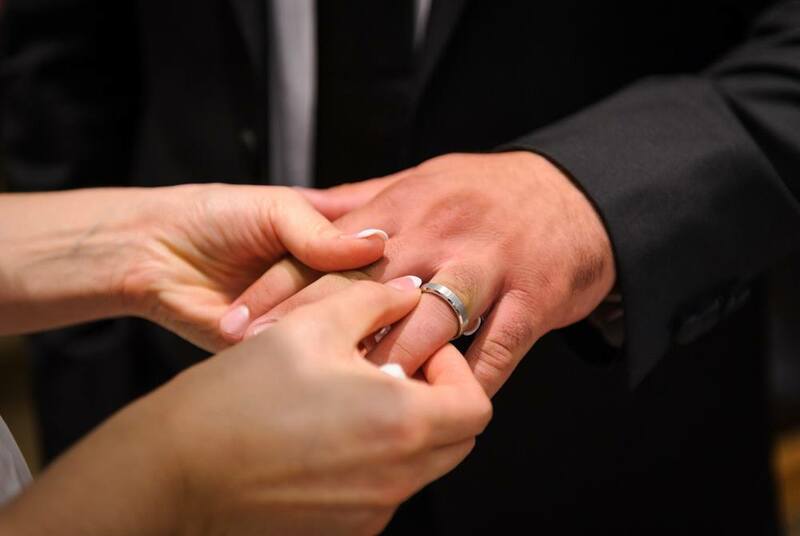 Customized rings may occasionally veer from the traditional round wedding band. One of the more unique rings we styled featured two square-designed bands of white gold atop a single square band of yellow gold. Each of the four corners was secured with narrow columns of white gold to separate each band for a towering appearance. For the final touch, a small white diamond was bezel set to add an asymmetrical edge. Many men like to think beyond the basic band. 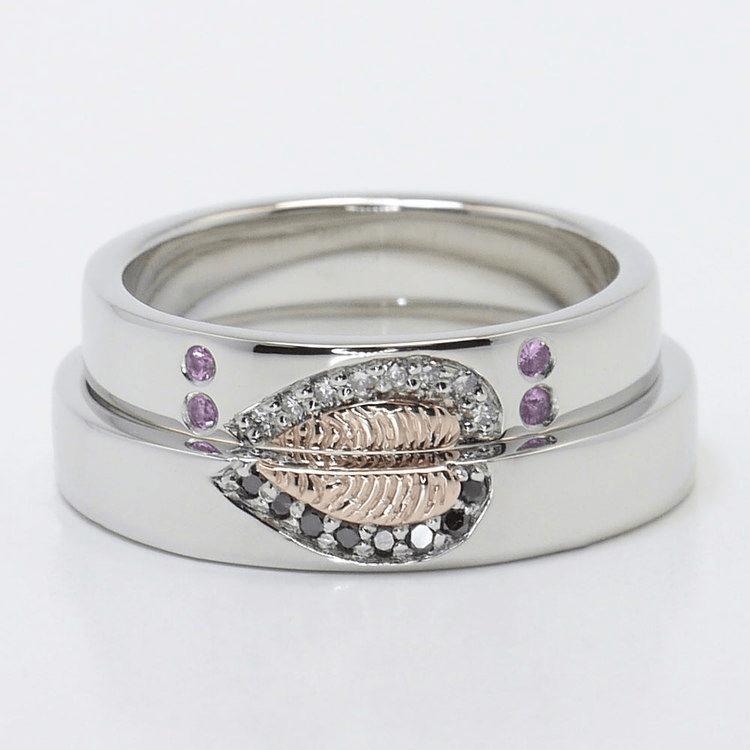 Custom rings for men show off his individual sense style and personality. Whether he’s interested in different metals, interesting textured finishes or hints of diamonds and gemstones, turn his vision into a romantic reality. When your beloved wants a ring that doesn’t fit the stock mold, create a custom men’s ring that perfectly captures his dream with Brilliance.